Published by Diversions Books 2006. The Rosslyn Chapel founded in 1446 and completed several decades later is without doubt an extraordinary building. It is a few miles south of Edinburgh and came to especial fame recently due to Dan Brown’s iconic ‘Da Vinci Code’ success. It is, he says, a place where the ‘Holy Grail’ might be discovered. The chapel has always been considered a unique and architecturally outstanding building, but now its significance is further increased. It profile is enlarged by the discovery by Thomas Mitchell and his son Stuart that the decoration on the ceiling of the Lady Chapel and around the various pillars has coded music on its roof bosses and in its general decoration. His arguments are set out in the book which along with the CD gives a fuller picture of what lies behind his discovery. First, why the Rosslyn Chapel? Mitchell makes out a case that the Chapel is the end of, in fact the seventh stage of, a pilgrimage route from Compostella where the bones of St. James were discovered in the 9th Century. The pilgrimage takes in Chartres, more of that later, and Amiens in Northern France as well as Notre Dame in Paris. All of these cathedrals had/have mazes, again more of that later. These seven stages/sites are linked says Mitchell by ley-lines. Towards the end of the book he points out how these lines were first discovered by pre-flood humans, who were supremely intelligent and who were able to make the links between the sacred sites. This was only to have them taken over by Christians thousands of years later who also realized their significance. Further evidence of this is that the family who had this great collegiate chapel rebuilt on or next to the ancient site were the remarkable St. Clair family. They came over with the Conquest, but according to the official guide to the chapel by the present Earl of Rosslyn it was the second Henry St.Clair who first lived and built a chapel here c.1120. This was at a time when the Compostella Pilgrimage was very popular and churches were going up on pilgrimage routes all over Europe in the prevailing Romanesque style. On a decorated boss William St.Clair is seen beside some cockle shells, the insignia of the St. James pilgrim. Of course one could argue that churches not on the ley-line also have significant connections with the St. James pilgrimage where their founders are discovered with the insignia. Various churches in Herefordshire for example, carved by the so-called Herefordshire School (c.1130) show the influence of the Romanesque work at Compostella. Their patron was Oliver de Merlimond who also visited the shrine. Similarly, churches in Worcester, Bristol and East Anglia. Why shouldn’t these churches have a special significance also? Mitchell tells us that the carvings of the angel musicians in the Rosslyn Lady Chapel are another clue as to its significance. These, he says, are striking. A variety of instruments appear including a bagpipe. These can be heard on the CD. But carved angel musicians are no rarity in roof carvings or any sort of ecclesiastical art work. Hundreds of churches have them. In Southwell Minster they are everywhere especially in the aisles along the walls and at Long Melford in Suffolk. Are we to believe that Southwell is on a ley-line and has music imprinted and secreted in its walls too? He also mentions an angel holding an open book and facing inwards which he thinks may indicate that we should be reading the music of the carvings like a book. Yet, such angels with open books can be in many other churches, for example Lincoln Minster. But what are these carvings and decorations? You must look above the angel musicians into the roof and into what has been described as star decorations. 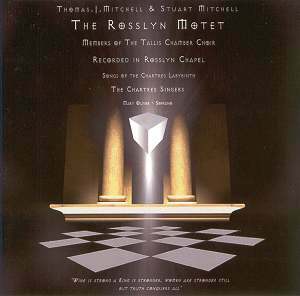 The CD booklet illustrates them as does the Rosslyn Chapel official guide. Mitchell calls them cubes and there are 213 of them, each slightly differently patterned. After what he describes as ‘a ten year mission’, Mitchell discovered that by using Cymatics he could unlock the pitches described by these patterns. The only problem being that Cymatics were not discovered until 1725 by one Ernst Chladni. So he has had to conclude that the St. Clair family were party to information perhaps discovered in what was then ‘Cathay’ and therefore not generally known at the time. 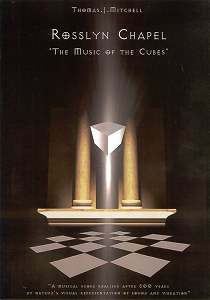 But what are Cymatics? The answer, put simply is sound waves and shapes. Any particular note can create its own wave-shape and it is these, embedded in the roof patterns that Mitchell has transcribed into music; music written therefore in the 15th Century and not performed since then, if ever. But what order to put the notes in? Where is the beginning and where the end? Almost arbitrarily he decided to start from ‘The Apprentice Pillar’; the most striking piece of work artistically. He says “this is the direction of the music, in my opinion moving South to North”. He noticed that a definite key began to emerge: A minor, the Aeolian mode. He does not tell us, whether, in true scientific spirit, he experimented and ventured to transcribe a tune in a different direction. Never mind that for now. He seems only to be discussing melody but on listening to the CD there are many sections in harmony although some are unison. Mitchell also speaks of “sections forming cadences” which obviously implies harmony. But from what source did he derive these harmony notes? He writes that a “simple phrase is repeated on the next arch”. This of course is not impossible in any patterning, be it on arches or on carpets. Then he had to define a rhythm for these notes. He feels that in “the middle phrases there is a definite feel of triple time” … “although a great beauty comes forth in duple time”. In other words: take your choice. Then I came at last to listening to the CD. I was fully prepared and generally speaking still open-minded. I should point out that I have been for some years investigating the relationship between the mathematics that lies behind much Romanesque architecture, especially at Notre Dame de Paris and the proportions found in the music of the contemporary Leonin and Perotin. I was ready to be impressed. Let’s start with the text. On page 52 of the companion book Mitchell writes “There are thirteen stanzas to the hymn and thirteen melodic arches emanating from the pillars which is possibly why the text matched up so well in form and meaning, the text carried the word easily”. The text is ‘Ut Queant Laxis’ which for musicians is important because it was used by the 10th Century music theorist Guido of Monaco as a helping hand in remembering the letter name of the scale. Whilst listening to the performance I attempted to follow the text. It is split into four sections as listed at the top. I immediately noticed that the stanzas were not clearly divided; there is no indication where each section begins. Secondly the first text you hear, sung by the counter-tenor is the second line, then the first verse and then I started to lose my way. I could not follow where we were; some lines are repeated some are simply not set. Mitchell has cut the text about in a random way simply to suit his whim. I felt that given the score I could have removed his words and pasted in phrases from Yellow Pages; it would have fitted perfectly well. I was not helped by the indifferent diction of the voices. In addition, throughout the CD, their intonation is not too good especially in the middle parts. On repeat hearings I have still not found my way through the text which apparently “fits so perfectly”. What does the music sound like? Presumably 15th Century music, possibly Dufay or Ockeghem? Well it sounds like no other 15th Century music I have ever heard. In fact it is like a weak pastiche. The way the melody - which Mitchell describes as beautiful but I think is rather dull - keeps reverting to a single pitch is most out of character and many of the harmonies are totally uncharacteristic as are so many unison passages. I do not have a score so I cannot pinpoint specific moments for you. There is little in the music that sounds authentically of its time. On moving to the four sections of ‘Songs of the Chartres Labyrinth’, the text, which is set out nicely in the booklet, again is not used complete. The last lines in some cases are missing but that does not matter here as Mitchell wrote this music himself and clearly says so. Curiously enough it inhabits the same sound-world as the Rosslyn motet. Labyrinths are especially important. Recently I read a fascinating book ‘The Maze and the Warrior’ by Craig Wright (Harvard University Press, 2004) in which Wright mentions the maze dances of the middle ages. He also points out, as does Mitchell in lesser detail, that ordinary folk who could not go on a pilgrimage, say to Compostella, could walk a maze in the cathedral and this would suffice. Cymatics have shown that wave-shapes often produce a Maze outline. On p.48 of his book Mitchell presents us with four examples. These are the Chartres Maze design (dated and still visible at the west end of the cathedral c.1225-30) and three shapes produced by Cymatics. There is indeed a striking similarity. But how does the music fit in to this you might ask … and where does the text come from? The text set is the ancient ‘Hymn of Orpheus’. I quote: it “was inspired by the sacred thread that runs through the Cathedrals and their history connecting them to the final mystical destination at the Rosslyn Chapel”. Well, I just found myself wondering why he set this text. The first one is addressed to ‘Equity (an aspect of Themis, Ma’at in Egypt) Goddess of Balance and Justice’ and is subtitled ‘Fumigation from Frankincense’. It begins, in translation, ‘Eternal friend of the one who is just and lawful/Abundant, venerable, Honourable Maiden/You are the dispenser of constant aid, a stable conscious and upright mind” etc. You get the picture. In the latter chapters of the book, the point is clearly made that the music and the chapel itself may well be the ‘Holy Grail’ so sought after. However we move from a repetition of earlier ideas, except written in a convoluted style where words seem to be placed at random. This serves only to cloud the issues. There is then a clearer chapter or two on music theory, chords and scales. All in all I cannot recommend you spend time on this fudge. There is however a proviso. You may think, as with the ‘Da Vinci Code’ that 95% of it is rubbish. In which case it is the remaining 5% that should worry you.